The Florida state seal identifies government buildings and officials and is a centerpiece for the Florida state flag. The symbolism, history and emblems of the seal are described in this article with fast facts and information. 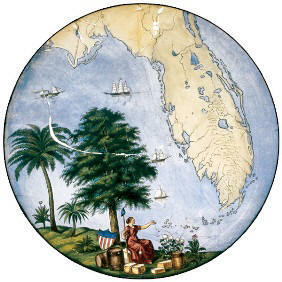 The 1861 first version of the State Seal of Florida featured a map of the state with boats off the Gulf Coast. A picture of the Goddess of Liberty sits in the foreground with barrels and wooden crates at her feet. She sits near a palm tree and a broadleaf tree. Liberty holds a pole upon top of which is a liberty cap. The pileus, or Phrygian cap was said to be worn in ancient Rome by slaves who had won their freedom. A shield bearing the emblem of the US rests next to her. 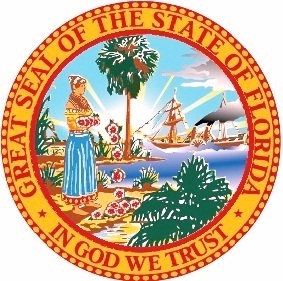 This version of the Florida seal was replaced in 1868. Florida was a part of the Confederate States of America from the beginning of the Civil War (1861-1865). The state of Florida returned to Union control on June 25, 1868. The 1861 Forida seal design was then revised in the State Constitution of 1868. 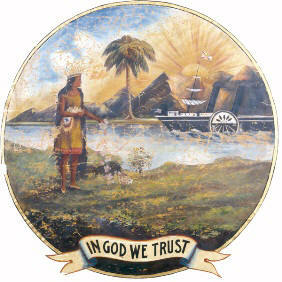 The Legislature sent to Governor Harrison Reed a Joint Resolution on August 6, 1868 specifying "That a Seal of the size of the American silver dollar, having in the center thereof a view of the sun's rays over a high land in the distance, a cocoa tree, a steamboat on water, and an Indian female scattering flowers in the foreground, encircled by the words, 'Great Seal of the State of Florida: In God We Trust', be and the same is hereby adopted as the Great Seal of the State of Florida." 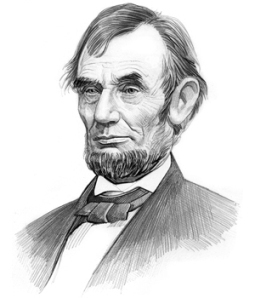 The 1868 Florida seal displayed several inaccuracies. The native american woman is wearing the clothes of a Great Plains Native American instead of a Seminole. Another effort, shown clearly in the banner below, shows a feather headdress on the lady, but only Native Indian males wore headdresses. Mountains are depicted in the background - but there are no mountains in Florida. The cocoa tree looks more like a coconut palm tree. This is the 1876 design of the seal is shown in the shield on the Florida banner depicting the Evergreen State and the 'Capitol Tallahassee' and the Native American woman is clearly depicted wearing a male headdress. The Florida state seal is kept and used as required by the Constitution and laws of the state.